Whether you need a gift for a discriminating recipient on your holiday list or are searching for the perfect gourmet touch to indulge your guests, Guylian Artisanal Belgian Chocolate Truffles can add a tasteful and elegant touch to your holidays. Made with the finest of ingredients, with the same skill and attentive care as when Guylian was founded in 1958, these divine chocolates will add grace and flair to your holiday and are certain to be welcomed with delight as gifts. 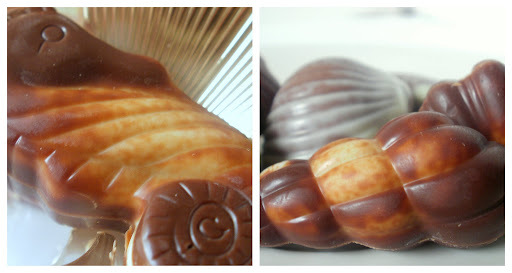 Guylian uses 100% pure Cocoa Butter to create their delightful signature seahorse and sea shell truffles, with each piece marbled from a combination of milk, white and dark Belgian chocolate to create a unique flavorful experience. These savory chocolate works are treated to a filling of praline truffle, made from an original recipe of founder Guy Foubert, created with roasted and caramelized Mediterranean hazelnuts. Guylian Belgian Chocolate Truffles are as scrumptious as they are visibly appealing. Sweet, succulant and filled with the most delicious hazelnut praline, I would be hard pressed to simply purchase them as a gift, as without a box for myself, they would not likely be let be for gift giving. I was simply amazed by the intricate details on each piece, with the marbling of the chocolate lending each its own unique look. Guylian is generously offering That's What She Said readers an opportunity to win a gift set of Guylian Artisanal Belgian Chocolate Truffles! Gift Set includes: One – 22 piece box of Guylian Artisanal Belgian Original Chocolate Truffles, Two - 6 piece Original Chocolate Truffle Boxes, Four - 2 piece Original Chocolate Truffle Boxes. This giveaway is open to residents of the US, 18+ and will end on Wednesday, December 12, 2012 at 11:59pm EST. Winner will be selected randomly from all eligible entries. Winner will be notified by email and will have 48 hours to respond before an alternative winner is chosen. If you email address is not available through your comment name, please leave it in your entry comment in anti spam format. Visit the Guylian site and share with me something you learned there that you found intriguing and why you would love to win this delicious gift set in a comment below. I would like to win because Guylian Chocolate is delicious! I learned that each batch of truffles is made with 100% cocoa butter! I would love to win this since they sound so good! I would love this b/c I love Guylian! I would pair Guylian with coffee, it melts faster! Mostly likely to gift Guylian to my mother, she loves it as much as I do! I'd also love to try the Chocolate Praliné Truffles Selection. The Chocolate Praliné Truffles Selection along with a nice glass of wine would be the perfect pairing for me. I'm most likely to give gourmet Chocolate to our 93 year old Aunt and my Mom. Both love their chocolate and they are very picky about it being a good quality. I would never buy something this wonderful looking for myself, so that's why I'm hoping to win! I learned that you can pair chocolate with beer!! I like Guylian at Facebook. I like you at Facebook too, I'm nqdenise. I learned Guylian Belgian Chocolates was founded by Guy Foubert who was born in 1938 in Sint-Niklaas. I gift chocolate to my in-laws and parents. I learned that they make Extra Dark Chocolate Truffles. I would give it to my parents for the holidays. I learned that their signature truffle recipe is still made in small-batch copper kettles exclusively by Guylian's Master Chocolatiers in Sint-Niklaas, Belgium. Each batch of truffles is made with 100% cocoa butter! I learned that they make Extra Dark Chocolate Truffles. I would like to win because I love chocolate! I Like on Guylian on Facebook as Kiara Auston. I Like That's What She Said on Facebook as Kiara Auston. I follow That's What She Said on Google+ as Kiara Auston. be perfect for my husband. I learned that they make sugar free bars and extra dark chocolate, too - I've wanted to try Guylian for a while, because I'm a real chocoholic! I liked Guylian on FB as Lle Schreiber! I liked That's What She Said on FB as Lle Schreiber! I'd gift the gourmet chocolate to my mom this Christmas - she's where I get my love for chocolate from and she's the best mom ever! The indulgent pairing of Guylian NSA dark chocolate with a mug of hot tea is most my style! I learned I can get this at Walmart. i learned that they have no-sugar-added bars, and i'd like to win because i haven't had these in a long time. Each batch of truffles is made with 100% cocoa butter. I'd like to win this because I love good chocolate. I'd love to try these, I'm a huge chocolate lover! The Dark Chocolate No Sugar Added Bars also looks good too! I learned the name is a mashup of the founder and his wife Liliane. I'm a chocolate snob. i see that they have praline flavored ones too! I would like to win because these look delicious. I would gift holiday chocolates to my sister. I'd have to give Guylian to my daughter. She's in college and loves it! They have Individually Wrapped Chocolate Truffles. I love them, they taste amazing. I liked reading the tasting notes. I learned that their chocolate is made with 100% Pure Cocoa Butter. The Artisanal Chocolate Truffles is my style of chocolate. I would most likely gift gourmet chocolate to my sister for the holidays. I found that the name was created through the marriage of Guy and Liliane in 1958. I want to win because I love chocolate, especially that made by Guylian. I Like Guylian on Facebook, jeffrey Lammers. I Like That's What She Said on Facebook, Jeffrey Lammers. I Follow That's What She Said (@tsue1136) on Twitter, @FireRunner2379. I Follow Guylian on Twitter, @FireRunner2379. I Follow That's What She Said on Google+, Jeffrey Lammers. Hazelnut Roast Coffee and the Mediterranean Hazelnuts in Guylian's signature truffle filling is the pairing of my style! I will be giving my wife gourmet chocolate because that is what she loves the most, besides me...It think! This will be gifted to my partner. He deserves it. I learned that they can be found at Walmart (although I haven't seen them at the local store) and would like to win some because I am a chocoholic. Follow you on G+ circles (Carol Gowett). Most likely to give them to my daughters. Since I don't drink wine, beer, coffee, or tea, guess I would have to have the chocolate by itself! I would love to win because they sound delicious. I learned that you can pair Guylian with wine like Port or Muscat/Moscato. I'd love to win because I am a huge chocoholic! This would be a perfect gift for my mother. I learned that they've been making chocolates since the 1950's! And I'd like to won for my mom, they're her favorite chocolates! I learned that they make Extra Dark Chocolate Truffles. I would love to win this because I live for chocolate. I'd love to have Guylian with Gourmet Coffee & Espresso ... Mmm! I enjoyed learning about the unique marbling--I would love to experience that sensation! The company was founded in 1958 and the name is a combination of the owners' names. These would make a great gift. Thanks for the giveaway. I would gift these to my boss. I'd like to pair them with handcrafted beer. The Artisian Belgian Extra Dark Truffles received the Superier Taste Award, and I'd love to try them! The Chocolate Praline Truffles look great! I learned from the site that Belgian chocolate is processed, known as conching, to a maximum fineness resulting in a heavenly creamy chocolate texture. That is the reason I want to try them. They sound wonderful. I learned that 100% cocoa butter is why it is so rich & creamy I would love to win this because it is my husbands favorite chocolate in the world! I learned that each of the truffles is signed with the Guylian G. I've been eating these chocolates for years but I've never seen that G.
Guy Foubert started the company. This would be for my mom, she deserves a wonderful treat. I was happy to see on their website that it pairs well with my favorite wine. I learned that Guylian chocolate is crafted and produced from 100% pure Belgian chocolate in Belgium. I'd love to win these because I have never had them.